Shopping malls have found themselves host to all kinds of public art, and with art comes graffiti. 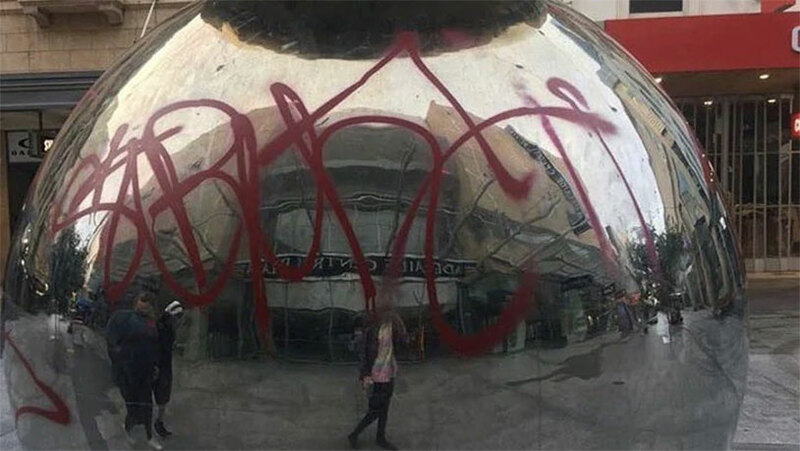 Now a vandal who spraypainted one of Adelaide, Australia’s most famous shopping mall sculptures has pled guilty to the crime. Here’s a little background on the “Mall’s Balls” of Rundle Mall. Designed by Austrian-born Bert Flugelman, the two stacked stainless steel balls provide distorted reflections of their surroundings since being installed in 1977. They even have their own page on Adelaide’s official government site. Flugelman intended the sculptures to be tactile and interacted with, saying “Kids go for it, they touch it, smear it and become part of it. Everybody can respond to it … After we put it up on the Sunday afternoon I went back on the Monday to watch community responses to it. A very little old lady came walking up to it and looked at it and then she opened up her handbag and took out her handkerchief and blew on the work and wiped it. I thought it was wonderful.” But we doubt he wanted some wag to spray red paint all over the thing, as happened in October of last year. The culprit was caught on security cameras and eventually brought in, where he pled guilty to the crime.